I want to fully backup my system before upgrading and I didn't have the means. I'm glad to say that my new 500 GB Time Capsule is making its' way to me as I write these lines. Since my Mac is not a home machine, but rather a critical business machine, I decided not to be an innovator in this case, although I did feel the itch. The third update (10.5.3, think of as SP3, how long did it take in XP?) will be released shortly and I think Apple engineers had enough time to squash most of the bugs. Eclipse does not officially support Leopard. This will change with Ganymede (Eclipse 3.4), which is due in the upcoming weeks. Time machine. I like simplicity. I need backup but I don't like caring about it. The new QuickLook for browsing documents without opening them. Spaces, the virtual desktop support. I usually have a number of window "sets". It will be cool to be able to switch between them. The updated Preview application with the ability to rearrange PDFs and resize images. Regarding the above picture. It is an amazing picture, IMHO. Too bad I didn't get it when Leopard was a big issue, I could've made a few bucks. It was shot in India, of course, as you can see from the Devanagari script. I took it in Pune, at the Katraj Zoo. 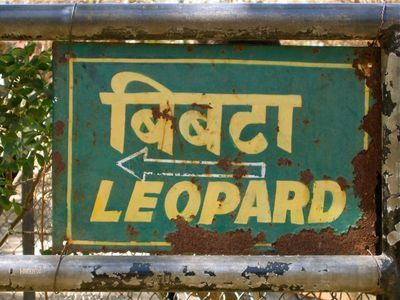 They do have a Leopard there. A dangerous one.